There is a new Jessica hat available in Disney Parks. 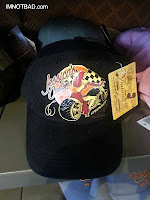 The Jessica's Custom Speedshop cap is available at several locations including Epcot and at the Gone Hollywood store in Disney's California Adventure. The cap is all black and has the same image on front as the Jessica's Custom Speedshop t-shirt. They are selling for $19.95 each. Thanks to everyone for giving the heads up on this new hat.